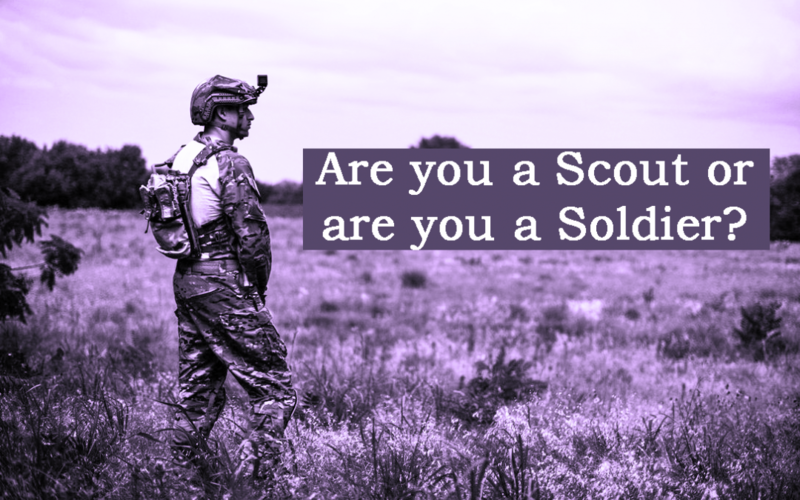 Are You a Scout or Are You a Soldier? Recent thought leaders believe the way you approach life, either as a scout or as a soldier, determines your success. A soldier is brave and strong and ready to fight for what he thinks is right. A scout is curious and focuses on gathering information before taking action. This blog’s intent is to share the “Scout vs Soldier” concept and resources to help you begin living life as a scout, not a soldier. To summarize the findings, the problem with a soldier is not in being brave or strong, but in fighting for what he thinks is right…even when he may be wrong. The scout approaches each situation in an unbiased way. The soldier approaches each situation with a pre-determined bias or belief and conviction for what he thinks is right. The soldier sets out to confirm what he believes is right. Conflict arises when a person fights for what he believes is right, without considering the other side. Find this interesting? Check out this Ted talk! Julie Galef is the modern pioneer of this age-old topic. As a scout, when we approach a situation, conversation, or conflict seeking truth in an unbiased fashion, we hear, focus, and think differently. Suddenly we become better communicators. We ask more questions. The ability to let go of what you believe to be right, and set out in search of reality becomes a very powerful tool for leaders or anyone struggling to find fulfillment in relationships and life.